The Fender Standard Telecaster with Maple fingerboard and Black finish. The Mexican-made Standard Series represents a perfect balance b.. The Fender Standard Telecaster with Maple fingerboard and Black finish. The Mexican-made Standard Series represents a perfect balance between price and performance - an eminently attainable workhorse for any level of player. The latest incarnation of the Fender Standard Telecaster incorporates the best of the old and new, offering hotter single-coil pickups, shielded body cavities, medium jumbo frets, cast/sealed machine heads and six-saddle strings-thru body-bridge. The original solid Alder body still delivers the creamy, smooth tone that guitarists around the world have grown to love, while a pair of single coil pickups and a maple neck deliver trademark snap and sustain. Additional appointments include a tinted neck, parchment pickguard/control knobs, and a 70s-style logo. Since 1950, the Fender Telecaster has set the benchmark for radical, forward-thinking electric guitar design. The Telecaster is considered the first successful solidbody electric guitar, and cemented itself as THE go-to guitar of the post-war era. Over the years, Leo Fender was instrumental in evolving the design which helped shape the sound of the rock and roll revolution of the 1960s, alongside its brother, the Fender Stratocaster. Ingeniously engineered and heard loud and clear, it was a marvel of simple design elegance and workhorse utilitarian function. It is perhaps fitting testimony to its essential original rightness that the Telecaster has hardly changed ever since. Mexican-made Standard Telecasters offer a superb balance between affordability and reliability - an instrument to last a lifetime but won't break the bank. 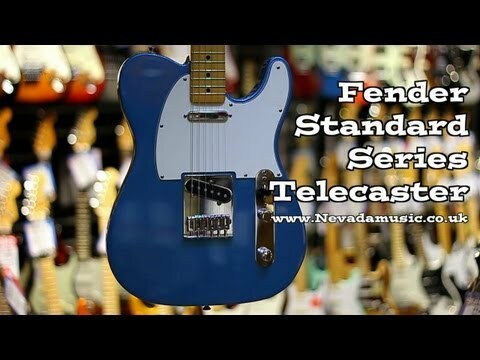 If your sound leans towards the country, jazz and blues side of the spectrum, the Standard Tele won't disappoint. As a Fender Premier Showcase dealer, there is no better place to pick up a Fender guitar. With stores around the UK, in-store experts for 1-to-1 demonstration and advice and thousands of guitars in stock, PMT have got you covered.